With the Republican National Convention underway, everyone is on pins and needles. Even me! Crazy how one comment can cause a ruckus. So I figured we or maybe just me, need a break. Today’s batch comes from the boy name list, all rejects again and this time I did have a few that were standouts or better yet, holdouts. Again there were a lot of ancestor names in this batch. More from Clem’s side this time around. Of coarse I am sure the obvious “what were you thinking” names are Kleinann, Burroughs and Barlow. Everett was a hold over from P.’s original list and Kimball was a favorite teacher of mine. Clem’s number one favorite for many weeks and from P’s original list was taken off, poor Finnigan. I had to take it off because I can’t name my son the same name as Christy Turlington, that’s just creepy. Andrade is my Great-Grandmother’s maiden name, it just didn’t fit and Ellis was my father’s middle name. I already have a niece with a similar name to Ellis. Now I know Seaborn is a little much but come on, it’s a pretty cool name for a boy. Seaborn James Cooley was my 5th Great Grand Uncle. Clem took off my Alber, oh sweet Alber. 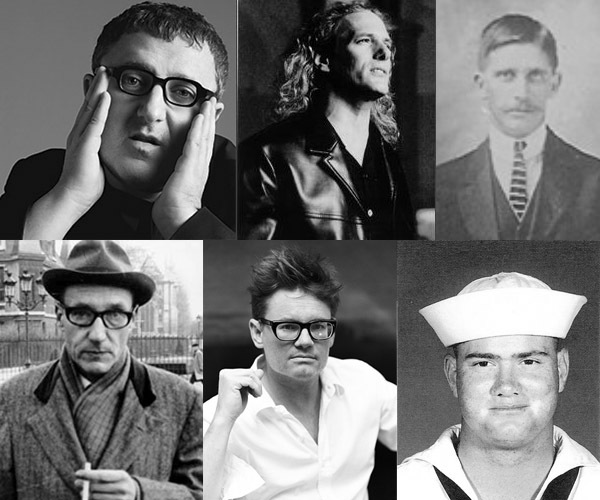 I took the name from one of my all time favorite designers Alber Elbaz (guy with the glasses above). Dewey wound up on the list because the only celebrity sighting we had in NYC was Dewey Nicks. Oddly enough clem and I both had a grand uncle named Dewey. One of my top 5 names from the begining was Archard. Clem took it off because it was close to one of his favorite names which will be on another list. Wait! Marriage Is Now A Civil Right.